James Cameron just loves to get in a submersible and go down into the depths of the oceans. It's as simple as that. Personally, I think he's one of the greatest filmmakers of our time, my respect for his work is immense. But as for his dabbling in the world of large format film -- he's still a bit green. His 3-D HD camera rig has opened up that big screen in a new and innovated way. But IMAX (70mm film) 3D is still far superior in both quality and performance. Further, the 3D in this particular production also suffers several ocular distortions which result in painful viewing. I had to look away from the screen more than once. That said, the film still delivers some visual gems. Once we get past a bunch of lucky scientists giddy as Jim about making the dive, the film finally shows us its diamond -- a gloriously elegant underwater animal the likes of which we've never seen. Perhaps a relative of the jelly fish, it flows like a transparent mobius band, a ring of flowing, glowing mesh. Truly beautiful. And so then several other odd looking fish-creatures take screen -- of which the producers felt compelled to call the film "Aliens of the deep." The next segment concentrates on deep sea heat vents, the shrimp that swim in them, and the tube worms that grow in that environment. The 3D adds little to this material already very well covered in Volcanoes of the Deep. 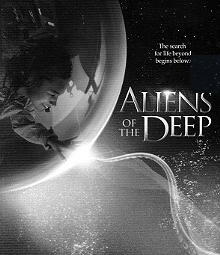 Fortunately, the film goes one step further -- it strongly compares deep-sea exploration to deep-space exploration. It seeks to fine tuning the criteria that define "Life" or "Living organisms." If animals can live without sunlight on Earth, then they can live without sunlight in other worlds. Crisp computer animations detail a possible space mission to one of Jupiter's moons. We watch how a space probe might break through that moon's icy surface deep into the water that may flow below and then start its search for life. Overall, some gorgeous sea animal finds, multi-cam shots of giddy crew goes way long, heat vents interesting, but not new to LF. Aliens of the Deep (IMAX 3D). Copyright © 2005.